1. No two surgeries or the after effects are the same. Surgery on the brain can vary dramatically, one person with a very similar tumour position and very similar surgery can have a very different outcome to another person even with the same type of tumour and surgery. One can have very limited side effects and return to work after just a few weeks and the other be unable to walk, have numbness or pain and need disability support. It doesn’t seem to only depend on other circumstances such as age or health (which obviously matter) but also the ‘unknown’ of the brain. There is a large element of having to let go of the result and trust. 2. You will have a brain injury. No one has ever said this to me. 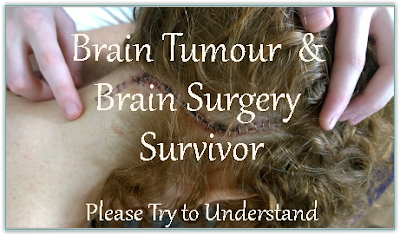 But realistically both the tumour and surgery cause brain injury! Acknowledging it would be helpful. 3. There are some very commons side effects. Fatigue, dizzy spells, poor balance, lack of coordination, nausea, cognitive and personality changes, strange head pains, a partially numb head, neck tightness and brain fog. I have previously written about my 'Cerebellum Surgery Side Effects' here and the general 'After Effects of my Brain Surgery' here. With my posterior fossa craniotomy, they also cut my greater occipital nerve on the same side - being told I would have a numb head after would have been super helpful to know beforehand! Thankfully seizures are rare with cerebellum tumours and the external drainage tube inserted often during surgery is the main risk factor. Maybe it would not be beneficial to the patient to be told these side effects before surgery, but certainly a booklet giving them the information when they are discharged from hospital would have been very helpful. 4. ‘Back to Normal’ will probably not be your previous normal. You will be alive, the tumour (hopefully) removed and (hopefully) without major issues (although I know they cannot and did not promise that) and may not need frequent medication or follow up, so they say you are ‘back to normal’. But you are almost definitely not going to be the same as before. See my various posts on Craniotomy Side Effects. Even supposedly minor side effects take a while to get used to, and so many at once with a slow working brain can feel overwhelming at times. Gratitude for what you do still have helps. 5. Alternative therapies can help. Each of the products I used or therapists I have listed, I believe helped me heal. It seemed the more I used the faster, and better, the results. Not having the money to continue definitely slowed progress as I feel I improve more again when I am able to afford and look after myself again more with the various things that have previously helped. I have also read in a few places that being gluten and dairy free, or following a ketogenic diet has helped others. Do look at what you feel is best for ‘you’… but in general eating junk food and consuming loads of sugar isn’t going to help healing! Use any physical, occupational or speech therapists offered, or ask if you think they can help. Personally I only needed neuro-physiotherapy and I feel the exercises given really helped with my balance recovery. Although I am currently pursuing neuro-ophthalmology as I am still struggling with my vision and think whilst my eyes can basically see normally and are ok in tests, they are not working together smoothly. Also seek support both from and for caregivers. I have listed the support from many of the UK brain Tumour charities on my support page. I wish I had been given this list when I left hospital – when I left with absolutely no information what-so-ever! In the first few days when I came home after surgery, I had to muster the energy to even walk to the toilet. I couldn’t carry anything remotely heavy - even my light handbag was too much and I HAD to sleep at least twice each day, and when I slept at night - I crashed out! After a few weeks I could do jobs such as hanging the washing on the line, but still had to get someone to carry the washing basket outside, and when I did so I felt shattered after. Once the pain of surgery scars had gone, I slept so much at night. I could easily sleep for 12 hours and still nap in the day. My brain was fixing itself, and it does that best when it is asleep. Over-sleeping, feeling exhausted after small tasks, low energy, aching after doing tasks or exercise, trouble concentrating for too long. When I do too much I tend to: say the wrong things, cannot find words, am delicate and sensitive to too much stimulation (lights, noise) and just feel overwhelmed. The hardest part is that I can’t predict it as fatigue doesn’t always appear directly after a stressful or tiring time and often instead a few days, or even a week later, I struggle. But even since the 2 years after surgery (when many say you no longer continue to heal or improve) it HAS got better. There is a great pdf on about fatigue from The Brain Tumour Charity here. Knowing that if you didn’t have surgery you would be dead brings up some very strong emotions at times! You know that you are not the same normal as you were before, yet you are alive and are grateful. You also understand that your tumour has a FAR better prognosis that most brain tumours, you know you are lucky. Yet you still had a BRAIN TUMOUR! And you still find the changes hard at times, the fatigue and mental exhaustion making it more emotional. The fact that something so major happened, the recall of the struggles around the time of surgery, the fear, the not knowing if I would be disabled after surgery, or even alive! Would my kids manage without me? Over stimulation will always be easier to do than before your brain surgery. Your brain’s tolerance for stimulation is much lower than a brain that is not injured. Sometimes just being in a room with others talking, listening to the washing machine spinning or the sun flickering between the trees will be too much, other days you can listen to music loudly just fine and manage flashing lights no problem. It can also be too much TV or computer screens, or just places with people talking or traffic driving past that can affect you. Any outside input is stimulation. It will depend on lots of factors including how fatigued you are and how much ‘stress’ you have had to deal with, but over time it should gradually get better. If you had broken your leg you would allow for it to gradually heal, and maybe always have a limp or some pain… your brain was broken into, and it may take a long time to heal. We know what we went through and that we are still healing. But this is mostly invisible to others, and people will judge you not knowing what you have been through. They won’t know why you wobble at times, say the wrong words or can’t even think of them, and they will have no idea how you are feeling emotionally. People will judge without knowing your story, and it can be hard to deal with at times. But the reality is that unless they have been there, or been close to someone who has, they cannot possibly know. It's Tough, Love, I'm Being Kind Instead! I have recently had a friend struggling with anxiety and depression after a stressful event, and people saying a few months down the line that ‘Tough Love’ is needed and that my beliefs on helping them cope are wrong. If someone is struggling they want your understanding and support, not your judgement? They already do enough judging on themselves! I also don't feel that one of the ‘recommended methods’ by many men I know of getting pissed and blocking it out helps ... Emotional pain is now being seen as the cause of most addictions as well as linked strongly to the stress - disease connection! Not facing or dealing with something painful and so somehow blocking it with habits... ‘Good’ habits such as being addicted to the gym or working or ‘bad’ habits such as drug addiction, gambling and alcohol. Or holding it in the body for it to remind you with illness that you haven't dealt with something a few years later. As a teen, and especially after my then boyfriend unexpectedly drowned when I was 17, I was never ‘allowed’ to express my shock, anger, fear, depression, anxiety etc - my emotions scared my parents so they tried to shut me up each time I said anything by distracting me. I was even drugged (by a doctor!) on the day he died to help me block it out! I think they were doing the best they knew in a time when ‘mental health’ still had somewhat of a stigma attached and ‘Mother's Little Helpers’ were still accepted by many! You know what helped me most...? Sobbing it all out from the core of me. When people say now in passing that I should put my experience of a brain tumour behind me, it just hurts SO much... Don't they think I would if I could? Every day, many, many times a day I am reminded about it, it may be a thought or a feeling. Yes primarily about the past - such as a numb head - a reminder as its not causing me pain now, but a memory of what happened. But also frustration and anger... when I say something wrong, when I cannot find the correct words or I don't understand something, when my close up vision is fucked and I am not able to do something, when my brain feels exhausted, when my balance doesn't feel right or I wobble... Yes it's not just the past I can't let go of ... It's the here, the NOW, reminding me every damn day. Reminding me I should be dead. But also the fears of will I ever get fully better or will I always struggle? And if so how much physically lower will another op take me? Could or would they even operate? Is feeling like that again - and worse - how I will die...? That I HAD to go to sleep terrified... Just having to trust I would be ok. I can see now that even the few months of this struggling was 'temporary', but at the time it felt it was never ending, I wanted someone to give me an 'end date' for it, so I could focus on a goal. But like depression or anxiety, it reduces, it might even go away, but you never really forget it. Do people really think I am fully over that??? Yes of course I'm grateful the worst is over and I am alive!!! That it’s so much better than it was. Anyway... It IS my past. I'm proud of it and even if the power from it goes in the future (and I don’t cry when I talk about walking down to theatre!) it also will never be fully gone, it’s part of my history. And I damn well want to help others who are in that same hole that I was find a way out... Throw them a few stones, ropes and ladders so they can hopefully climb out for themselves. Support them and offer them hope and trust. Nothing will make me do any different. 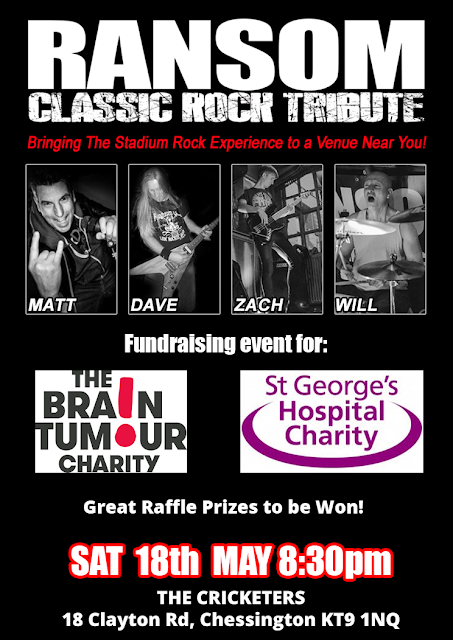 My favourite rock covers band Ransom are playing that night (Ransom includes my husband, Dave, and my son, Zach 😁) and I will be holding a raffle as well as collecting money for both charities. A Neurodevelopment Screening and Treatment Plan worth £850! £1 from each of my paperback book sales to both of the above charities, 50p to each for all Kindle e-book sales, plus...10% of any sales of original art on my website! ... PLEASE consider buying something! 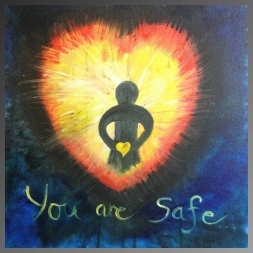 Also from the 11th - 25th May 2019 I will be holding an art exhibition at Dittons Library, Thames Ditton - where again 10% of any sales will be for these two charities.